After over a year of hard work, the Camino Project is proud announce Camino 2.1, a notable new update to the Camino web browser. Camino 2.1 includes a number of new features and enhancements, including overhauled location bar autocomplete, improved control over plug-ins, and displays web content using Mozilla’s Gecko 1.9.2 rendering engine, improving web compatibility and providing all users with an improved browsing experience. All Camino users on Mac OS X 10.4 and higher should update to this version. Users of previous Camino releases should be notified of the new version via software update. “Fill Form” can now read the homepage URL from “Me” cards created on Mac OS X 10.4 or later. “Fill Form” will now try to fill in fields that have “Website” as label text. “Fill Form” will no longer fill “surname” fields with the full name. Changed the default search engines to use SSL connections. Upgraded the Growl framework to version 1.2.2 to support interaction with Growl 1.3. The Camino Crash Reporter now includes the time a version of Camino was first installed when sending crash reports. Upgraded the Breakpad framework that supports the Camino Crash Reporter. Activated maintenance routines for the history database. Blocked versions of Adobe Flash Player older than 10.3.183.10 on Intel Macs due to severe security issues. Camino now remembers the state of the “Remember this decision?” checkbox in the “Allow Cookie” dialog. The body of the lock icon for pages with a mix of content served over SSL and content not served over SSL now matches the look of the lock icon for pages served entirely over SSL. 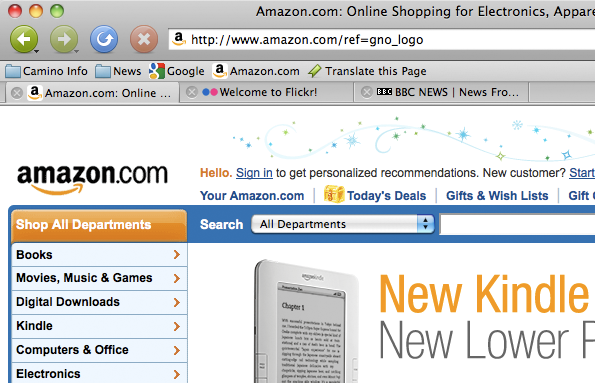 The multi-touch “pinch” gesture to zoom a web page works once again when invoked over the web page. Downloadable fonts will work once again for Mac OS X 10.7 “Lion” users running version 10.7.2 or higher. Upgraded the “Block Flash animations” code to use Flashblock 1.5.15.